It’s a video of the unknown that is posing many questions: What is it? Is it real? And what is it doing there? 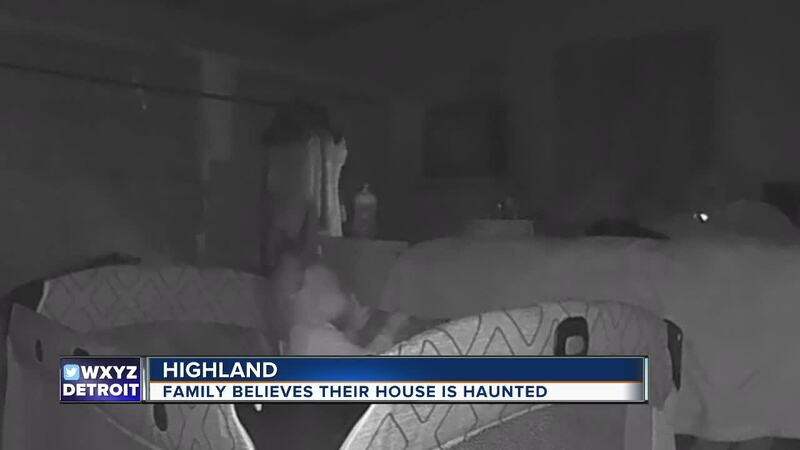 A family in Highland, Michigan, believes their house is haunted and what's even more disturbing is that whatever is haunting the home is doing harm to their little girl. Heather Brough and Joshua Higgins say they couldn't believe what they saw on their nanny cam. "It’s almost like she sees something that we don’t," Brough said. It’s an image she and Higgins say is haunting their home. "It was chilling," Higgins said. "It was literally a chill down your spine, like that 'what if' factor — is this what I just saw?" Caught on the couple's nanny cam video a few weeks ago is what appears to be something moving in front of the baby crib. The couple says it appears to be a ghost. "I freaked out," Brough said. "I stopped what I was doing and I ran upstairs and grabbed my daughter." She says this so-called ghost scratched her daughter Lily and attacked her too. "It scares us that it could do something else," Brough said. "I mean, there was a morning I woke up and I felt like someone’s hands were around my neck." A team of paranormal investigators came in and tried to answer some of the couple's questions and concerns. Higgins' father Jim says it may be someone who lived in this house before. "The gentleman that lived here originally committed suicide apparently by jumping out this window, which is one story down," said Joshua's father, Jim Higgins, while recalling a story he was told about the home. The couple says they don’t know why this so-called ghost is targeting them, but say they don’t want any part of it. "It’s not physically just going after her, it feels like it’s going after myself too," Brough said. "I couldn’t get an explanation out of it, so it’s freaky is what it is," Higgins said. The couple says for now they are staying at the home in a room together with Lily until they have enough money to move.